Plantago Linn., Sp. P1. 112. 1753. Gen. Pl. ed. 5: 52. 1754; Hook. f., Fl. Brit. Ind. 4:705. 1885; Pilg. in Engl. Pflanzenr. IV. 269 (Heft 102)1-466. 1937; A. Patzak and K.H. Rechinger in Rech. f., Fl. Iran. 15: 1965; B. Verdcourt in Milne Redhead and Polhill, Fl. Trop. 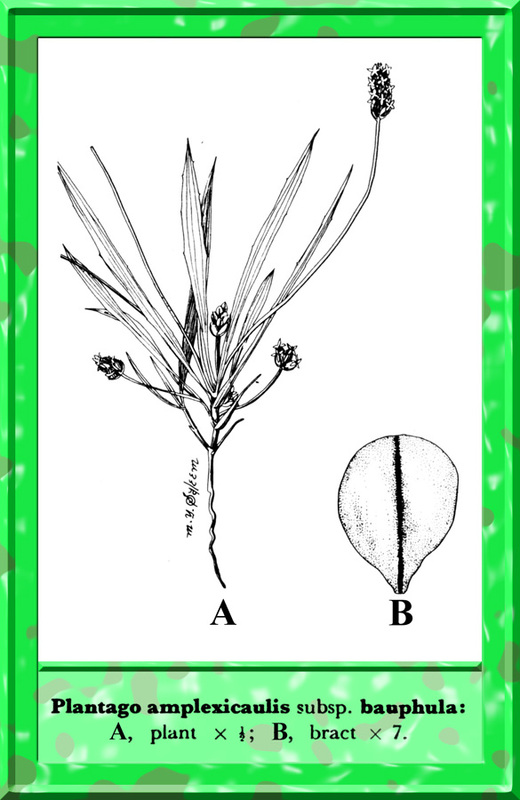 E. Africa, Plantaginaceae (1971). Annual or perennial, or mostly acaulescent herbs, sometimes an undershrub. Leaves usually all radical, sometimes cauline. Flowers hermaphrodite, dimorphic, polygamous, usually in many-flowered cylindrical spikes, rarely capitate. Calyx lobes subequal or 2 large and 2 small. Corolla tube cylindrical, sometimes contracted at the throat, usually equalling the calyx, sometimes exserted, lobes 4, equal, patent. Stamens 4, inserted at or above the middle of the corolla tube, often exserted. Ovary 2-locular or 3-4-locular with false free septa; locules with 1 to many ovules. Capsule membranous, circumscissile. Seeds usually peltate, testa thin, mucilaginous, albumen fleshy. A cosmopolitan genus, with approximately 270 species, which is represented in Pakistan by nearly 20 species.